Yesterday after my doctor's appointment (see horror story here), I saw someone I recognized in the waiting room of the office. This gal works at the same place as me, so I chatted with her for a few minutes. She told me she's been trying for a while, but this is only her second appointment and she hasn't yet been diagnosed with anything. I gave her the scoop on me, and we commiserated. Then she asked me not to tell anyone at work what was going on. Of course I would never dream about telling anyone about her business (I can blog about it, because no one in real life knows I even have a blog), and I assured her no one would hear a peep out of me. She hasn't told anyone outside of family what's going on and she just didn't want to get into the mess of questions, advice, and explanations. I completely respect her decision not to tell people about infertility. I struggle all the time with who to tell and how much to tell and how to navigate this whole process. And honestly, my first instinct was to zip up this information into an airtight, opaque container and never tell a soul about it. I felt inadequate and insecure and I can completely understand the inclination to avoid well-intentioned-but-sometimes-hurtful advice. In fact, after we first got the news that I have POF, my husband had to convince me to even tell our parents. Since then, I've told lots of people close to me. My family knows the story, some of my closest friends, my boss, a few coworkers. And as scared as I was to tell a single soul in the beginning, I'm so glad to have widened my support network. The people who know about my infertility have come to really help me get through this. They've been shoulders to cry on, lean on, vent and complain to, and extra hands to help pick up the pieces after every disappointing blood test result or negative pregnancy test. One friend, who has PCOS and went through two rounds of IVF to get her precious 6 month old babe, has been particularly helpful. From sharing her experiences to sending a card or e-mail when I need it, she has definitely been in my corner. 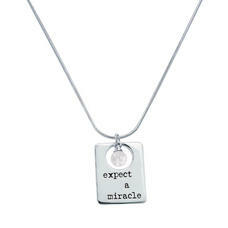 About a month after I was diagnosed, she sent me a card that contained a necklace. The necklace alone was enough to bring tears to my eyes, but the story behind it really got me. 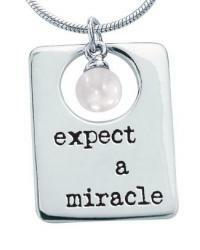 She told me that her cousin gave her this necklace when she (my friend) was going through her first IVF. Someone else had given it to her cousin when she too was struggling to get pregnant. Each person who had it before me ended up having a baby. I'm the fourth person to wear it and I hope someday I too can pass it on to someone who needs it. I put the necklace on immediately and haven't taken it off since. (FYI, you can order the necklace online for $30 here). I've also found, as I've widened my "circle of trust" (to borrow a reference from Robert De Niro in Meet the Parents), that a lot of people struggle with infertility. I told a co-worker yesterday at lunch and she then divulged to me that she's had two miscarriages in the past year. Even when I've told people who already have children, I've learned that the road to conception wasn't easy for some of them. It helps me to know I'm not alone. While it's true some people don't know how to respond and end up saying really stupid stuff, in general I can appreciate the decisive lack of the question, "So when are YOU gonna have babies?" and being able to talk to people other than my husband about all of this. Because let's face it: as supportive and wonderful as my husband is, he can't handle the gravity of this situation (and my emotions) by himself. And I don't want to put all of that on him to take on solo anyway. All of this being said, I still understand the urge to keep fertility struggles to oneself. Talking about it has helped me a lot (and really, so has writing about it), but it's not a one-size-fits-all kind of deal. How do you decide who to share your story with? Has talking about it helped or hurt? Seeing your necklace made me tear up. Thank you for sharing! You can take a look at my blog (I just started it yesterday, so it is a little rough) here : Keeptryingkate.blogspot.com. Talking to my husband, parents and even sisters has definitely helped. We have also told my inlaws and I have told my 4 closest friends from college and my husband has told a couple from grad school. My support group and therapist also help a ton. Right now I dont want to tell any more people for a couple reasons.